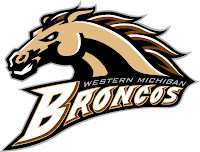 Western Michigan’s hot start continued over the weekend as the Broncos took two from host Alabama-Huntsville. Both games went down the final seconds, but WMU, now 4-0-0, eked out back-to-back 2-1 victories. In the opener, Trevor Elias scored his first collegiate goal. He put home a rebound with 9:42 remaining that gave WMU its first lead of the night. Earlier in the evening, Cam Watson was awarded a penalty shot. He converted, beating UAH goalie Cameron Talbot for the first penalty-shot goal by a Western Michigan player since Pat Dwyer against Nebraska-Omaha back on Nov. 1, 2002. Jerry Kuhn made 31 stops in his first start of the season. In the second game, goals by Elias and Chris Clackson put WMU up 2-0 in the first period, and the Broncos, backed by Riley Gill’s 29 saves, skated away victorious for the second consecutive evening. Western Michigan next faces Michigan State (4-2-0, 1-1-0-0 CCHA) in a home-and-home that begins at Munn Ice Arena Friday at 7:05 p.m. and concludes at Lawson Ice Arena Saturday at 7:35 p.m. These games will be WMU’s first conference games of the season.